Homeowners love how a concrete basement provides a safe, clean and dry area to store possessions or expand a home’s living space. What they don’t love is how concrete cracks. Cracks in a basement wall can let in water or signify that there is a structural problem with the foundation. Injecting a basement wall crack with epoxy will stop any water leaks and structurally repair the wall. First, the basics. All concrete basement walls crack. These cracks are due to the concrete shrinking as it cures and the water in the mix is removed. This shrinkage places stress on the concrete and to relieve that stress, the concrete cracks. The cracks will develop soon after the foundation is cast in place. The vast majority of cracks are not a sign of a structural defect with the foundation. While it is difficult to determine by looking at a basement wall crack if it is in fact a structural problem, there are a few rules to help guide you. If the crack is over ½” wide there is a chance that it is a structural crack. Horizontal cracks are almost always a structural problem. Cracks that run on a severe diagonal, especially those that start at an inside corner are usually a structural issue. It should be noted that diagonal cracks that start at the corner of a window or where the foundation “steps down” and are under ½” most likely are not a structural issue. If you are not sure if a crack is structural in nature, an engineer can be hired for a few hundred dollars to determine it for you. The engineer may use a crack stress gauge to help in determining if it is. The repairs made to a basement wall crack are performed from the inside of the basement. Epoxies are injected into the crack in a liquid form. The epoxies are a two component material that is mixed as they are injected into the crack. After mixing they will cure to form a hard and strong material to reinforce the wall. In fact, the epoxies have a higher compression and tensile strength than the concrete itself. Once the epoxy has cured the crack will not leak water. Step 1. Attach Surface Ports – Plastic injection ports are attached with a special surface paste directly over the crack. These ports are spaced every six to twelve inches. Step 2. Seal the Crack Surface – Once the ports are attached, the rest of the crack is covered with the same special surface paste. This is not what makes the crack water proof. It merely keeps the epoxy in the crack as it reacts and hardens. Step 3. Injecting Epoxy into the Crack – The injection process starts at the lowest surface port. A mixer that attaches to the epoxy cartridge is inserted into the port. The epoxy is in a liquid form and flows into the crack. It will flow all the way to the outside surface of the crack. Once you see the epoxy start to come out of the next port above you stop injecting into the current port and move to the one above. A plug is inserted into the first port to keep the liquid epoxy from leaking out. Proceed until all of the ports have been injected. Epoxies start to cure as soon as the two parts are mixed. They start to reach a semi-rigid gel after about 20-30 minutes. After several hours they will start to become hard. Final cure strengths are usually achieved after seven days. This article is written by Aaron Kuertz with Applied Technologies Aaron has been in the waterproofing industry since 1998. Applied Technologies is a manufacturer and supplier to professional waterproofing contractors and homeowners in the United States. 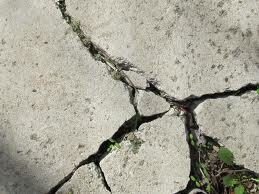 To learn more about epoxy concrete crack repair visit Applied Technologies on the web. This entry was posted in Articles and tagged epoxy inject concrete repair method. Bookmark the permalink.